I'll start by using my old tag line "I'm not handy". This is my opinion, but I really think I don't give myself enough credit. History has shown that in most projects I take on, I do okay. Today was "install the dishwasher" day. We bought a Bosch Ascenta about a week ago and rather than spend the $150 to have it installed, we thought we'd save a little money and do it ourselves. I had no less than four people tell me that it was "easy" and 3 of those promised me they would be on retainer if needed. Based on those assessments I thought I'd give it a go. I started by watching a YouTube video where a Canadian guy installed one. It looked fairly straightforward, and the video was only 21 minutes long, so I figured how hard can it be? Bear in mind that the Canadian guy didn't live in a house that was 91 years old. His was new or new-ish. So I get started by plugging in my work light that is halogen and, I kid you not, two minutes into being on it blew. Seriously? C'mon man. I take this as a bad omen. So the fear and loathing sets in. What am I going to do? Eventually, I had Donna open it slightly and re-close the valve and the water slowed down to a workable trickle. (That valve should also be looked at REAL SOON, by a REAL plumber.) Bear in mind that at this point we've soaked 3 towels and emptied 14+ cereal bowls of water. "Contain the water" is my mantra. I pull the unit out and look at what I have to work with. Of course it's copper from 1962, nothing like the "convenient flexible hose" in the stupid Canadian video. So I deem that at a junction, I can put an adapter to go from copper to "convenient flexible hose". I take off the piece and run to the hardware store for the first time. A very helpful, but way, way to conversational young man named John helped me get the right fittings. It was clear he was getting paid by the hour and I was getting paid by the job as it took 20 minutes longer than it should have. But I digress. I go to the register and realize I have no wallet. Seriously? C'mon man! Back home I go and when I return, the guy who helped me was much older. I told him what I was doing and that I was going to use the old copper nut, etc,. and he said "Oh, no. You need to cut the copper and replace the ferrule, or else you'll spring a leak and have trouble." When I questioned the process he so quickly described, he treated me like I had never done this before...maybe because I never have, dude! 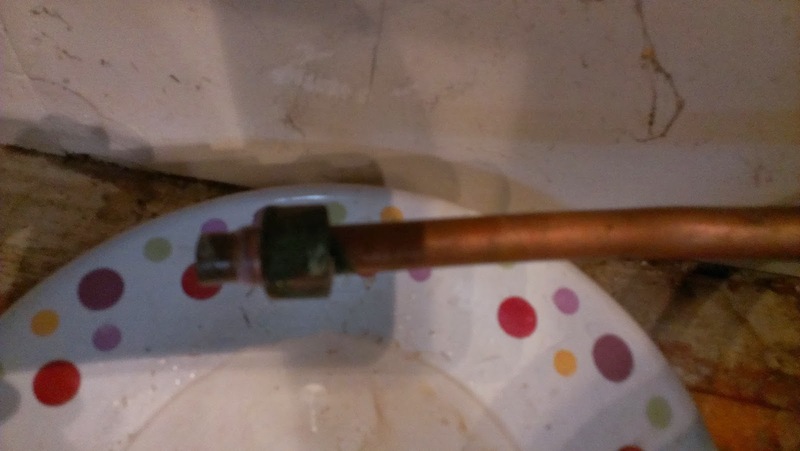 Nevertheless, he demonstrated how to use a copper pipe cutter and, well, $17 later, I left the store with the fittings and a new copper pipe cutter. I had my doubts about cutting copper, but dang if I didn't cut it like a pro the first time. I put on the fitting, attached the "convenient flexible hose" - ala Canadian Joe - and was ready to finish the install. I move the machine into place and hook the outlet hose into place. Then I hook the still dribbling inlet hose into the brass fitting going into the dishwasher. I turn the water back on and as I go to level the legs, I see there's a leak at the fitting. Understand that I put plumber's Teflon tape on the fitting before I screwed it in and didn't "overtighten" it as the instructions warned. Why then, pray tell, was it leaking. Seriously? C'mon man! The problem with detaching the inlet hose is that it's now full of water and a little bit of pressure. When I loosen the fitting, of course it's like a garden hose with someone's thumb over the outlet. "Honey, I could use some towel's and bowls here!" Same story with the cruddy shutoff valve. Turning it off required turning it on again briefly and then off again. I started the job at 10:00 AM, it's now 5:00 PM. The fitting comes off after some choice words and a few knuckle scrapes. I retape it and replace it, cross my fingers, turn on the water and voila! No leaks. My confidence is restored momentarily and I finish up with hooking up the electric, levelling the legs, and securing it to the counter top. We switch it on and I check for leaks. I'm doing this by laying on my stomach with a flashlight and peering into the dark nether lands of the dishwasher slot. 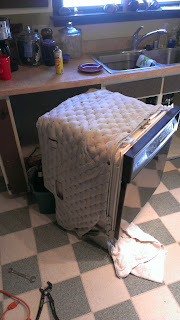 As the washer runs and I see no leaks, I am awash with a stupid kind of self-help joy. It was like finishing a marathon or something. I could have laid there for hours. It was friggin' beautiful, man. So I learned a few things today. I am handier than I give myself credit for. This stuff isn't easy and I do okay. Always check your mains and valves. Whatever wrenches you have, you need a size bigger (or smaller). Hardware stores don't sell stuff on the honor system. This ain't Mayberry. Don't be afraid to ask your wife to hand you towels, bowls, life preservers, or snorkels. Don't be afraid to text your "handy" friends (complete with pictures) if you're not sure. Always have a second halogen light for backup or a big, honkin' flashlight. Whatever time frame you have for the job, double it, or maybe even triple it if your house is 91 years old. Flexible hoses are convenient and put copper to shame. Plumbers earn every cent they make. Always buy your beer before you start the job. You'll likely need it at the end. That's it for now. 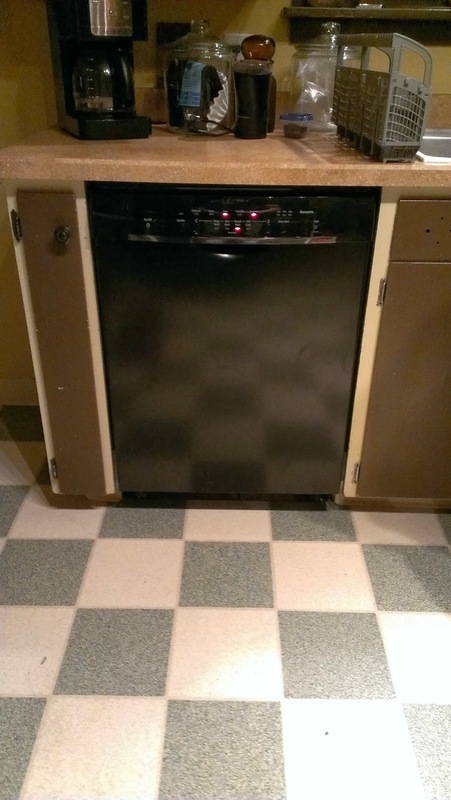 I'm going to go lay on the floor and listen to my dishwasher run.